Grabbed by the Ghoulies is the first game made by Rare after they were purchased by Microsoft. It’s not really remembered all that fondly, but I have a feeling that that reputation is caused by the buyout because I like it a lot and there’s been a bit of an anti-Rare sentiment about since then. The story follows two teenagers called Cooper and Amber who enter an old mansion after they got lost on a dark and stormy night. The mansion is owned by Baron Von Ghoul and is full of ghouls. The pair of them keep falling into more and more problematic situations and as Cooper you have to fight through the ghouls to find the secrets of the house. The story is quite simple but it leads in to a very fun game. Each level has you getting through a different room in the mansion and to do that you have to fight and defeat ghouls in different ways and within different limitations. You punch and kick and you use items in the room as weapons and it’s all very enjoyable: it’s also very simple and easy to get into the swing of. Other fighting-based games have very complex control schemes, but this one literally just has you pointing the right stick in the direction you want to attack. Simple and endlessly fun. What makes this game especially entertaining is that all of the ghouls have tonnes of personality. They all interact with each other in funny ways, they all make silly noises and they all have funny reactions to being attacked by you. My personal favourites were the skeletons, which just so happen to be the ones you see most often. Those skeletons were downright hilarious. Plus, on the subject of tone and charm, the game is full of references to other Rare games. You’ll find Banjo-Tooie character portraits up on the walls, pictures of Mr. Pants and Captain Blackeye, Sabre Wulf posters and much more too. They even fitted in a Donkey Kong Country reference and Banjo’s pet goldfish Roysten is actually in the game himself! It feels very much in-line with the world created in the Banjo-Kazooie series and I liked it a lot. Overall, this is an amazing game. 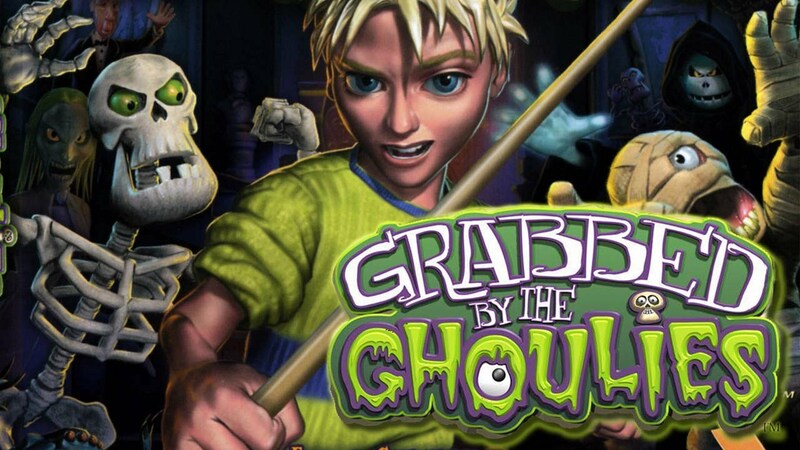 It’s enormously fun, has excellent graphics, a great spooky soundtrack and is deeply charming. History is unfair in how it remembers Grabbed by the Ghoulies and you should definitely give it a try.